You want to put a transition on some text or some images or video above the Secondary Storyline and it affects the Primary Storyline below. The screen goes black during the transition. 1. This happened today to me. Simply re-launching FCPX fixed it. 2. Try putting what's attached to the Primary Storyline into a Secondary Storyline. Highlight it, and all clips associated with it, say if it's a series of pictures or text, then hit COMMAND + G to put it into a secondary storyline. Apply your transitions and see if they only affect the upper Secondary Storyline. 3. Still not working? Try making the content inside the Secondary Storyline a Compound Clip but highlighting them all and hitting OPTION + G. Then dig into that compound clip by clicking on it's name/title/icon bar thingy (no idea what it's actually called, but it's the top of the compound clip, just below the "Shelf" of the Secondary Storyline) and you'll be inside that Compound Clip in another Timeline. It's like a Nest in old FCP. Apply your transitions then tap COMMAND + LEFT BRACKET to go back to the main Timeline, the one the Compound Clip is inside of. 4. Still messed up? One last thing to try is to Right-Click on the Transition itself and look to see if you can toggle "Transition to/from Black". Usually it's greyed out though for some reason. - You can Right-Click on a Transition in the browser and open a copy in Motion and try and edit it. I'll save that post for another day, though. I've had this happen to me often. For some reason or other the skimmer just decides to stop skimming. I think it knows when I think it's helpful and when it's getting in the way so when it knows that I'm finding it helpful it just quits to maintain it's annoyance. 1. Simply go to your project icon in the Browser and double-click it. This will reload the project (sometimes so fast you can't tell anything happened) and the skimmer will start working again. 2. You left Transform on. I have a habit of hitting Shift + T for the transform mode of a clip and forget to hit the Done button (or the blue Square icon button in the Inspector in the Transform section) to turn Transform off. While Transform is on, you don't seem to be able to Skim for some reason. 3. The third thing to try of the two things to try is to tap the "s" key in case you accidentally just toggled Skimming off while you try to reconcile some of the legacy Keyboard Commands with the new (and sometimes not only non-sensical but completely opposite) Key Commands. Here's a handy FREE app to convert Audio pretty painlessly. It's pretty straight forward in use. Drag audio files in, set output format and hit go. Don't forget to head to preferences and set it's output destination to someplace you'd like first. I set it to source folder, the default is in iTunes' music folder. I've run into this a few times. The solution turns out, while simple, is completely non-intuitive. You've connected a client's phone to pull off all the "tons of absolutely great" videos and photos they've taken to "help" with the project. And you, being the editor kinda-sorta have to use them because heck, the client themselves took them just for you for their project. You connect their phone (or iPad or whatever) to your Mac via the cable and launch Image Capture and nothing shows up. Both the Mac and the phone just sit there. Wonderful. Yep. It'll ask if you want to access the connected device. Hit "Trust" on the phone and they'll show up after a few seconds in Image Capture and you can just highlight them all and drag them off and "forget" to use them later on because they're useless and blurry and shaky. Yes. Hard as it is to believe that's how it's done. If you just want to Untrust the phone you just trusted just now, open the Lockdown Folder and then sort by date created and delete the most recent one. I ran across this today and the fix is simple. I have a powerpoint that's a .pptx PowerPoint file. That means it was created in PowerPoint 2007 or later. Now, .ppt is for earlier versions than I think 2007. A client sent me a link to a PowerPoint that was to be used in an edit and for some reason QuickView nor Keynote could open it. Keynote threw out an "Import Error". I then noticed that the file was filename.pptx.ppt when it should have just been .pptx. Somehow the download service that they used to send me the file for some reason appended on .ppt to the file. Changing the file from .pptx.ppt to it's original .pptx file extension solved the problem of opening it in Keynote. This isn't really a FCP tip per se, but I was editing -doing a favor which is another way to spell free- at someone's home recently helping them with a project and noticed after a while that their Time Machine back ups were taking forever; it seemed to be constantly running. It was using a bit of CPU and really thrashing a connected drive. I checked the Console (Applications > Utilities > Console) and typed in "Starting standard backup" into the search box and looked at the times Time Machine had been running. Looking at the times between "Backup completed successfully" and "Starting standard backup" I saw that backups were taking near 50mins, meaning that Time Machine wasn't grinding away for only 10mins every hour. I looked around a little bit and one thing to try to fix this, other than just turning it off as it's a problem from 10.6.x all the way to 10.8.x, is to perform a Safe Boot. 4. When it finishes booting (and log in if it asks you to) wait for it to settle down, don't launch any apps, then Reboot. This time don't hold down the SHIFT key. 5. Wait for Time Machine to run again or force it to run by selecting it from the menubar and selecting "Back Up Now"
In a backup or two you should see back ups moving along much faster. There's some complicated stuff going on here with UUID's and Deep Traversal but this is one quick thing to try to solve it before you delve into deleting backups or using another drive (which people often think fixes it but just starts a new backup which you could get by formatting your current Time Machine drive) or running repair utilities. This process is for if you have a Time Machine back up drive directly connected to a Mac. I'm not sure how well or if at all, this would help a slow network backup. I ran into this the other day and learned a few things about printing that convince me that understanding the Voynich Manuscript may be simpler than understanding printing "standards". Ok, you get a PDF from a client and use Quicklook to look at it, or Preview or toss it into FCP 6/7 and some of the pretty colors the so-called "Creatives" over there made are now showing up as black. This is also a problem on some versions of iOS it turns out but this post is about OS X. Simple solution? 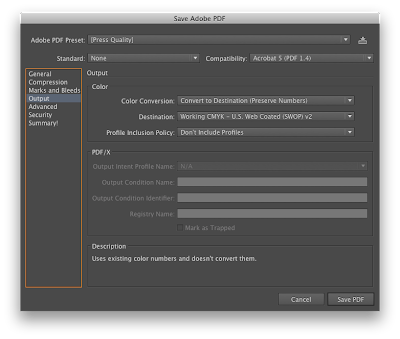 Use Adobe's free PDF viewer. The under-the-hood solution is that some versions of Mac OS and FCP and Preview don't understand things called Spot Colors. In a way Spot Colors are kind of like RGB and CMYK only they're different. Bottom line is that in order to display the colors correctly update Mac OS to the latest, say Mountain Lion or open the PDF in Illustrator or Photoshop, you may have to add in a white or whatever background then save it out as a TIFF or Jpeg or something. Then dump it into FCP. From the other side, a better but more complicated solution is to convert the PMS values to CMYK right in Photoshop or Illustrator. Basically open the PDF in Illustrator and Save Adobe PDF and for Destination select something like "Document CMYK - US Web Coated (SWOP) v2" or something similar. Don't include profiles, may help. I'm not sure. 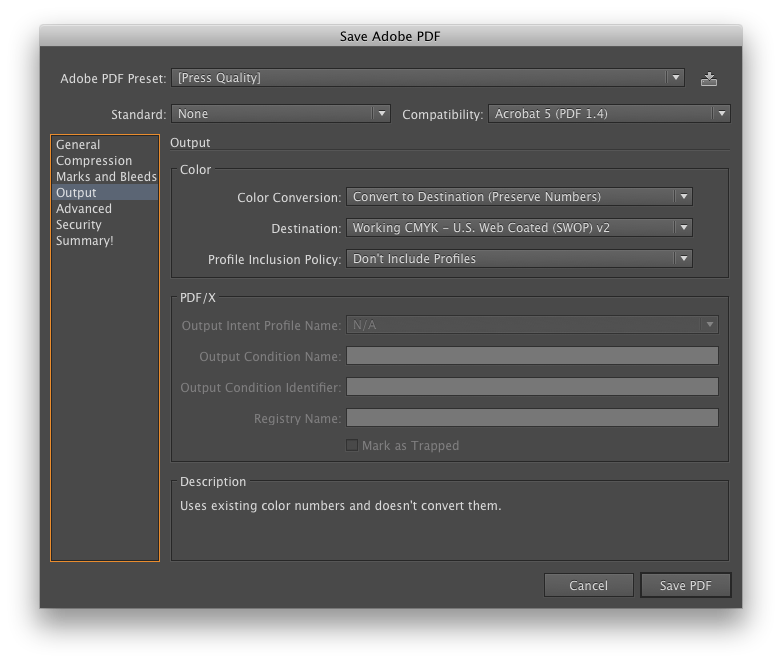 Another option is to select Edit > Edit Colors > Convert to CMYK then save the PDF. Several times now I've installed Box.com's BoxSync app only to find out after it's installed that I cannot empty the trash. I use Box.com a lot for clients and turns out they're using it more and more but Box.com's installer needs some work and I've emailed them a few times to let them know with not results. What happens is you install the app, toss the installer into the trash and hit Empty Trash or your favorite key combo (mine is COMMAND + SHIFT + OPTION +DELETE) and the Mac yells at you about how it can't do that and tosses up an error code of -8003. Rebooting then emptying the trash doesn't help. Holding down option when you empty trash (see key combo above) doesn't work. Trying to securely empty trash doesn't work. 2. Type EXACTLY and without quotes "cd .Trash" hit return. 3. Type EXACTLY and without quotes "ls -al" hit return and see all the stuff that's in the trash. 4. After you confirm what you want to delete is in the trash type EXACTLY and without quotes "rm " that's lower case rm and a space(bar), then type the first letter, paying attention to capitalization of the file and tap TAB to auto complete it. This is for FILES not folders or packages! 5. Hit return and it should be gone. Hit return and it should be gone. Finally. If you really want to find the offending file and don't have a ton of stuff in the trash you can move items back where they were, meaning back on the same volume, drive, folder or whatever, just not in the Trash. I put stuff from one drive into a new temp folder I name "TRASH THIS!" so they're not loose all over the place on that drive. Then put them in the trash and delete them one by one. Eventually you'll hit a folder or file that won't delete. Recently I had a file that was actually a package that wouldn't delete and tossed up the -8003 error. Here's what I did once I found the file that refused to be deleted. - Type "cd" space-bar then drag the folder that has that file into the terminal, it'll fill out the path then hit Return. - Type this EXACTLY, "rm" space-bar, then the first letter of the file that won't delete, then the Tab key. Hitting the Tab key will fill out the rest of the file name saving you from typing or worse, mistyping it. Hit Return and it should delete the file. If it's a folder, from inside the folder that folder is in (see "cd" above) it's in, add a -rvf to the command. This will show you all the things it's deleting. If you want to confirm every file before it's deleted I think you can add an "i" to the string of switches like "-rvfi"
I noticed today that an export was going along smoothly then suddenly crawled to nearly a halt. Glancing around I just happened to notice that the hard drive the file was being exported to had only a few gigs left on it. Another case of someone putting something into the trash and failing to empty it. After emptying the trash -and freeing up over 30 gigs of space- the export speed seemed to pick back up to what would be expected. I'm not 100% sure that was the cause, it could have just coincided with exporting (and rendering out since nothing was pre-rendered) a particularly graphic laden section or something. It's not aimed at any particular level of experience nor meant to be anything other than a random collection of things that I found helpful along the way when using Final Cut Studio. If you're interested in helping out or contributing just let me know.